Awakening: Ron Paul Draws 7,800+ at UCLA Rally! 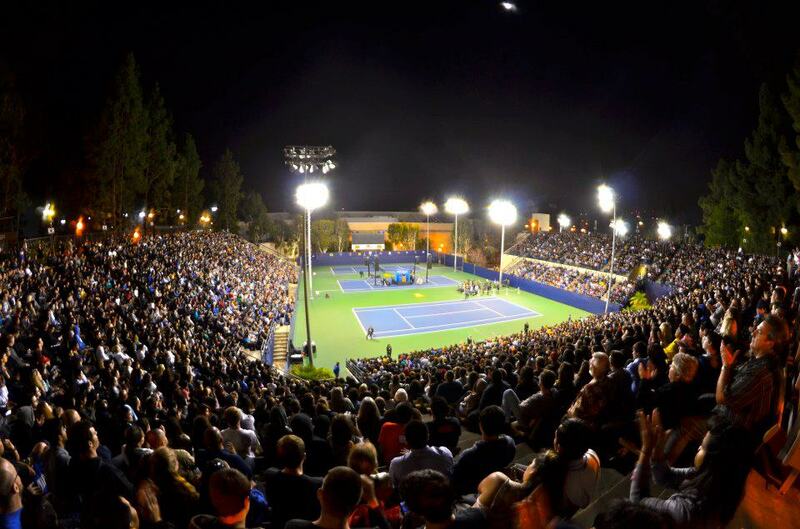 Republican presidential candidate Ron Paul used an appearance Wednesday night before an overflow crowd at Straus Stadium at the Los Angeles Tennis Center at UCLA to reiterate his calls for a smaller federal government and to change the nation's foreign policy. "The problem... boils down to one thing -- government is way too big," Paul said, drawing cheers from the crowd estimated at between 6,000-7,000, filling the 5,800-seat stadium, with others climbing nearby trees to see the speech. The 12-term Texas congressman repeated his call for repealing the 16th Amendment that permitted the federal income tax. Paul has said that restraining federal spending by enforcing the Constitution's limits on the federal government's power would make the income tax unnecessary. Paul also drew cheers when he said "it's time to change our foreign policy. Why don't we look at the Constitution? There's no authority for us to occupy other nations and tell them what to do, so we shouldn't be in the business of occupying." What the Paul campaign called a town hall meeting came in the midst of a three-day series of appearances by Paul at California campuses organized by Youth for Ron Paul, which has 591 chapters and has recruited more than 53,600 people, according to the campaign. The trip began Tuesday at Cal State Chico and is scheduled to conclude Thursday night at UC Berkeley. The Paul campaign is using the trip to attempt to register more of Paul's supporters as Republicans, enabling them to vote for him in the June 5 California primary. Paul is scheduled to return to the Los Angeles area May 1 for a $2,500 per person fundraiser in Bel Air, where Nassim Taleb, the author of "The Black Swan: The Impact of the Highly Improbable" is also set to speak.